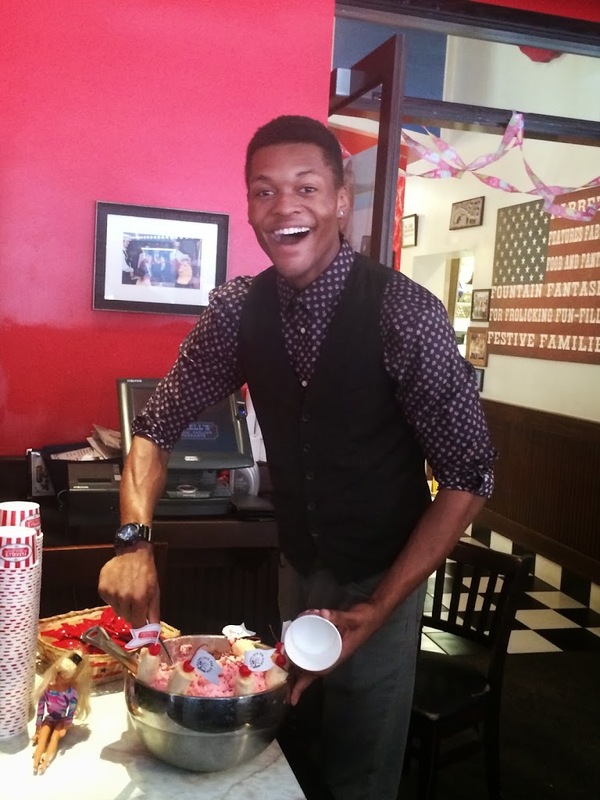 Farrell’s 5th Annual Charity Ice Cream Eating Challenge! June 4, 2014 / Entertainment, Food, Let's Eat! 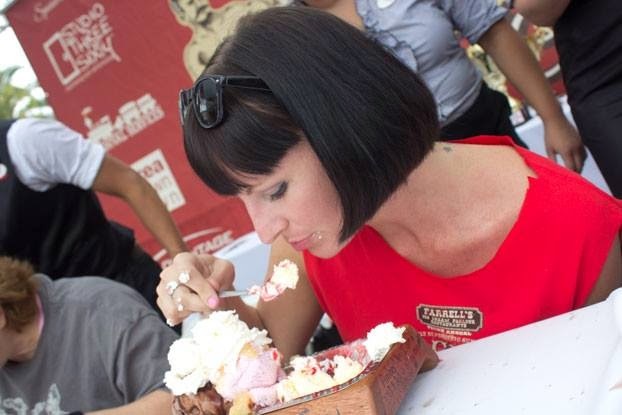 Farrell’s 5th Annual Splendiferously Superific Summer Spectacular Ice Cream Eating Challenge is almost here…and it’s going to be as ridiculous as ever! Did you know that 100% of the net proceeds from this event benefit CHOC Children’s and Make-A-Wish? How awesome is that? Do you see why I LOVE Farrell’s? 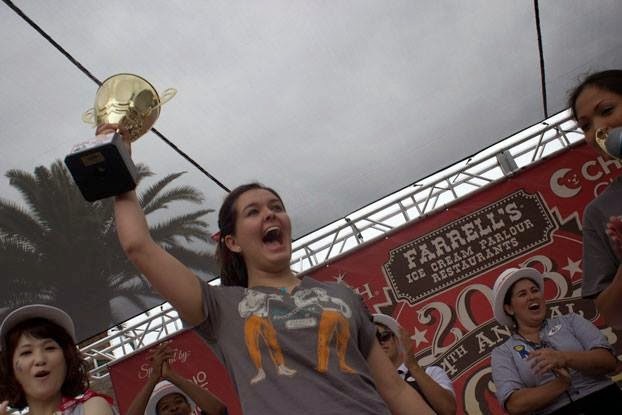 Beginning Friday June 20 through Sunday July 13, Farrell’s will be looking to qualify the fastest ice cream eaters to compete, head-to-head, at their Championship event, which will take place on Sunday July 20 in Downtown Brea. From June 20 through July 13, anyone with an appetite for fun and ice cream can walk into any of the seven California Farrell’s locations during normal business hours and to try and qualify! In order to qualify as one of the fastest, and be placed into one of the categories, guests must eat a “qualifying sundae”. Categories will include Men’s, Women’s, Kid’s, Big and Small (one adult and one child), 4-Person Teams and Professionals. Amateur guests can qualify by eating a 3-scoop ice cream sundae as fast as they can. 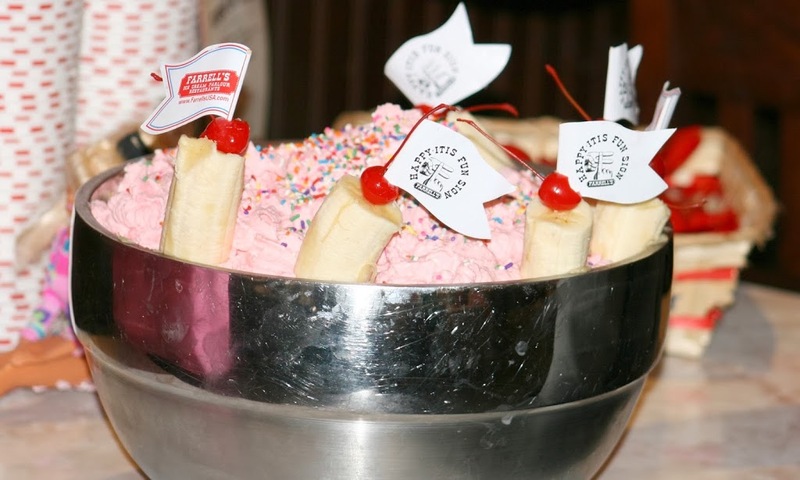 Professionals may qualify by eating a 6-scoop sundae called the Pig’s Trough. 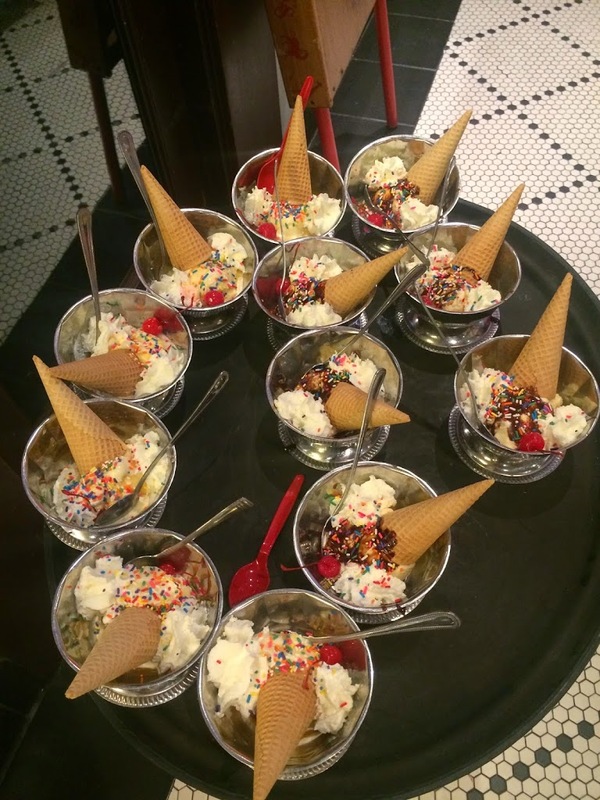 Professionals can qualify by eating one of these 6-scoop sundaes called the Pig Trough! 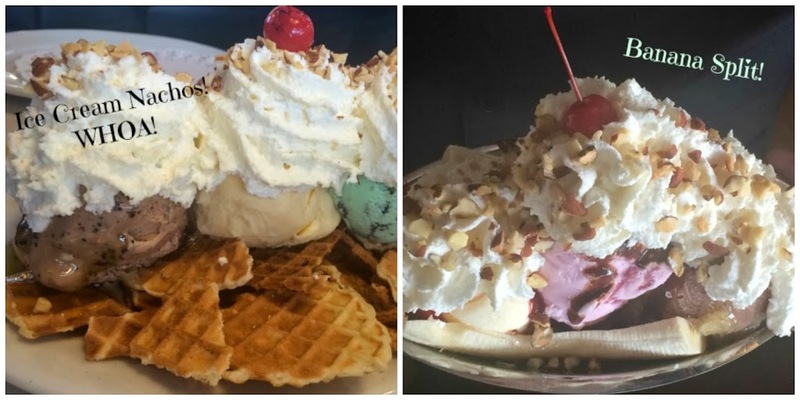 All sundaes include chocolate, vanilla, and strawberry ice cream, hot fudge, pineapple and strawberry toppings and are then covered with Farrell’s freshly made whipped cream. The cost for amateurs to attempt to qualify is $20, for all categories, and $40 for professionals. Each entrant will receive a limited edition event t-shirt, a $5 coupon for a future visit to Farrell’s and the qualifying sundae. Remember: 100% of the net proceeds from this event benefit CHOC Children’s and Make-A-Wish! 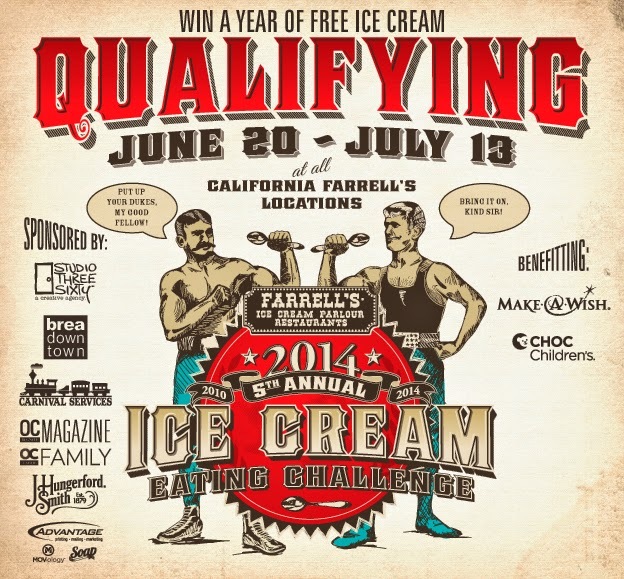 Farrell’s will invite the top qualifiers to their Championship event in Brea on July 20! Farrell’s will actually close down Birch Street in Downtown Brea, in front of their Farrell’s location. The Championship event is an all day family festival and will take place from 11am until 5pm. There will be lots of rides (courtesy of Carnival Services), games, prizes, raffles, food, booths, music, and more! 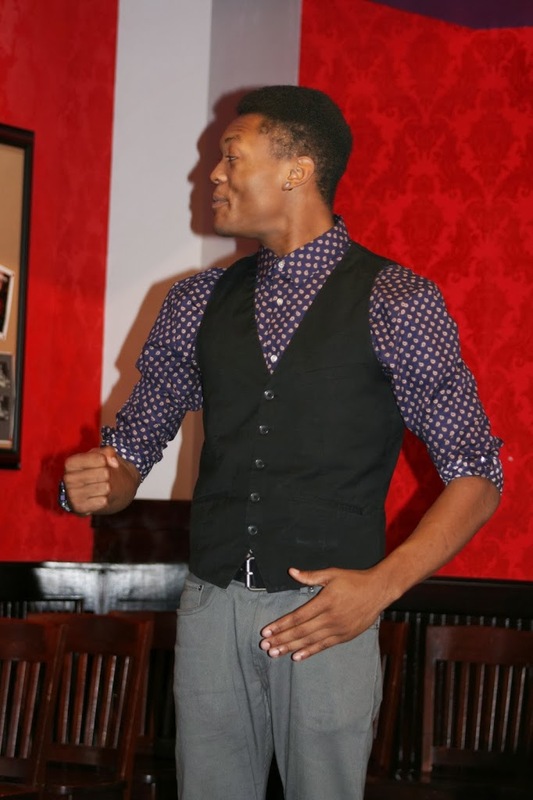 How fun does last year’s event look, especially when you’ve got Max rockin’ the mic! This guy looks like he’s still hungry! 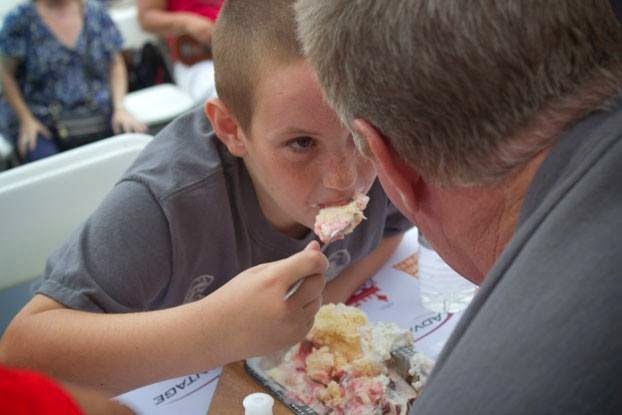 At the Championship event, the Men, Women, Kids, and Big and Small categories all compete to be the first to finish a Farrell’s famous Pig’s Trough that has 6-scoops of ice cream and all the toppings. 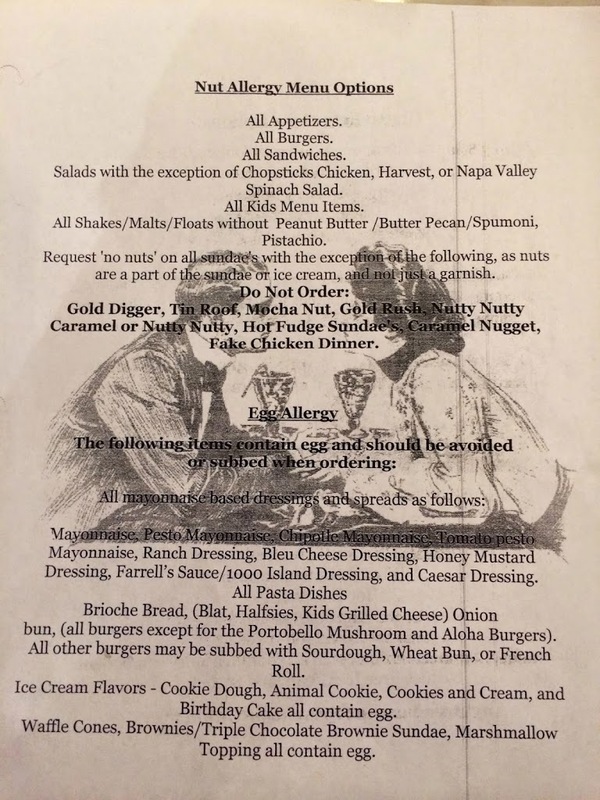 The 4-person team and each individual professional are going to attempt to finish a Farrell’s Famous Zoo sundae, which is 30 scoops of ice cream with all the toppings. If you enter in the Big and Small category, you can use teamwork to win it all! Winners from each category will win a trophy and a year of free Farrell’s ice cream. 1st place in the Professional category also wins $300, 2nd place wins $200 and 3rd place walks away with $100. One of last year’s winners! Farrell’s also has an option for those that just don’t have the stomach to pound ice cream as fast as they can, but still want to participate in all the qualifying fun. During the qualifying period, June 20 to July 13, guests can get the event shirt, the ice cream “qualifying sundae’ to eat, along with a $5 coupon, all for the same $20, but they just won’t be timed. 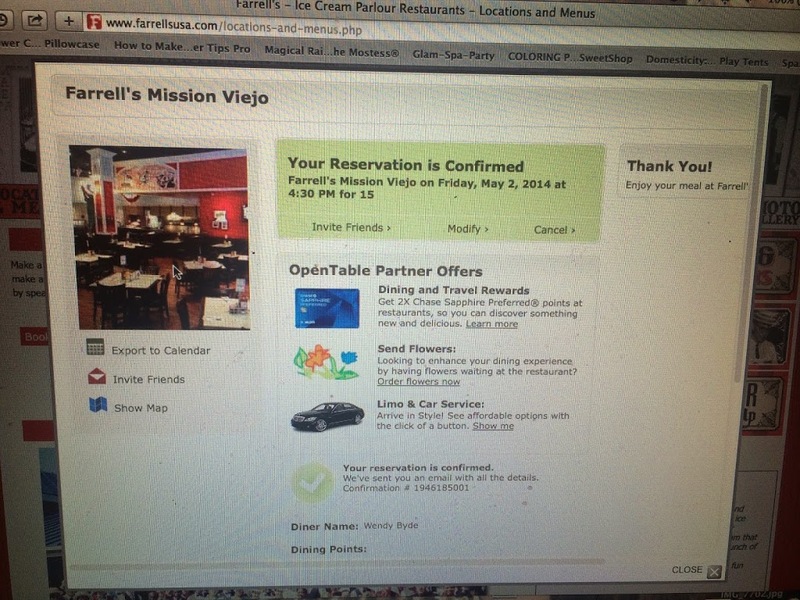 All YOU need to do is let your Farrell’s server know. Qualifying Farrell’s locations include Brea, Buena Park, Mission Viejo, Rancho Cucamonga, Riverside, Sacramento, and Santa Clarita. Complete details and rules can be found at Farrell’s website, FarrellsUSA.com/Challenge. So who wants to win a year of free ice cream? I think Emi and I are going to attempt to qualify for a category! Don’t worry..I’ll post pictures, when we do attempt it! 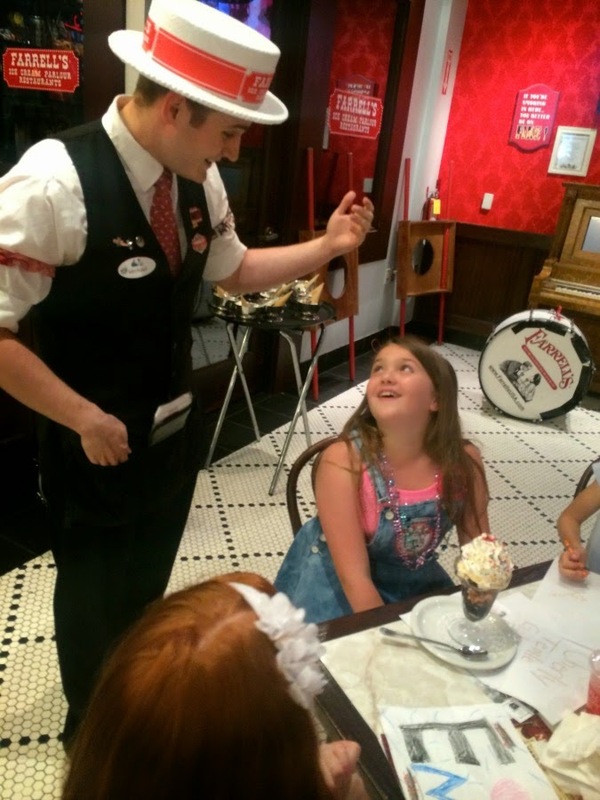 Farrell’s is Teaming Up with The American Red Cross to Help! There is nothing scarier than experiencing an earthquake of a significant magnitude, in addition to several aftershocks, like the residents of Southern California did this past weekend with the 5.1. It really makes you think about important things such as having a plan of action for your family, in case of an huge earthquake or other disaster and just having overall earthquake preparedness at home. It’s not something that any of us like to think about, but we DO need to be ready, in case of the unexpected. As if a 5.1 earthquake wasn’t scary enough for many of us to experience last weekend, we then watched news of a deadly 8.2 magnitude quake that hit Chile yesterday, resulting in such great loss and devastation! It’s difficult to watch things like this on the news! It makes you feel helpless, in the sense that you can’t make it better or directly help the people who are affected. It makes my heart happy when I see businesses I support and frequent, come forward to make efforts to reach out and help people in need, like the people of Chile. It’s no secret that I’m a fan of Farrell’s, and it makes so proud to spread the news about what Farrell’s is doing to help with this recent tragic situation. Farrell’s has teamed up with the American Red Cross to raise earthquake preparedness awareness in the wake of these recent earthquakes. Beginning today, Wednesday April 2 through Sunday April 6, all 7 Farrell’s Ice Cream Parlour locations will be offering a limited edition “Quake Shake” for $4.99, with 100% of sales going to the American Red Cross. In addition, you’ll also receive a handout about earthquake preparedness, with instructions on how to be ready for a large magnitude earthquake. Locally we were all very fortunate not to have suffered any major damage or injuries as a result of last weekend’s Southern California earthquake, but the people of Chile weren’t as fortunate. The Farrell’s family is making this great effort to help the American Red Cross reach people and areas in need. These kinds of situations remind us how important and essential it is to be prepared and we should all do our part to make sure organizations like The Red Cross are funded and ready to assist those in need, when a disaster like this occurs. 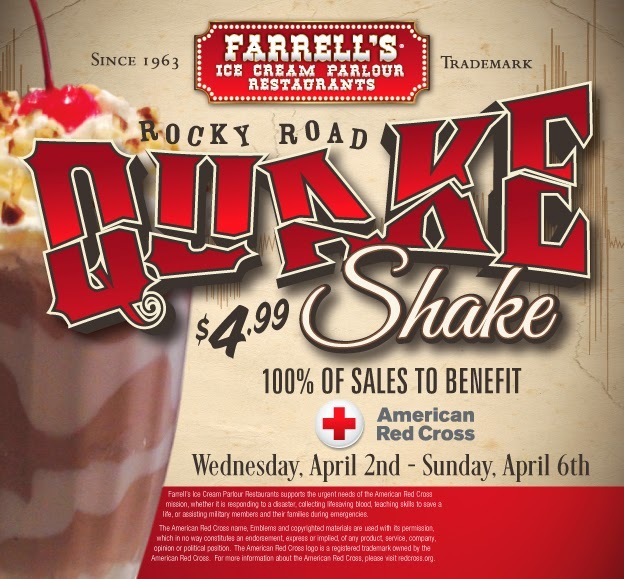 Please support this effort by visiting your local Farrell’s and enjoying a “Quake Shake“, which is a Rocky Road flavored shake, made with rich chocolate ice cream, marshmallow swirl and topped with whipped cream, almonds and a cherry. Remember, 100% of the sales from this $4.99 “Quake Shake” will be donated to the American Red Cross. In addition, monetary donations will also be accepted at each restaurant. 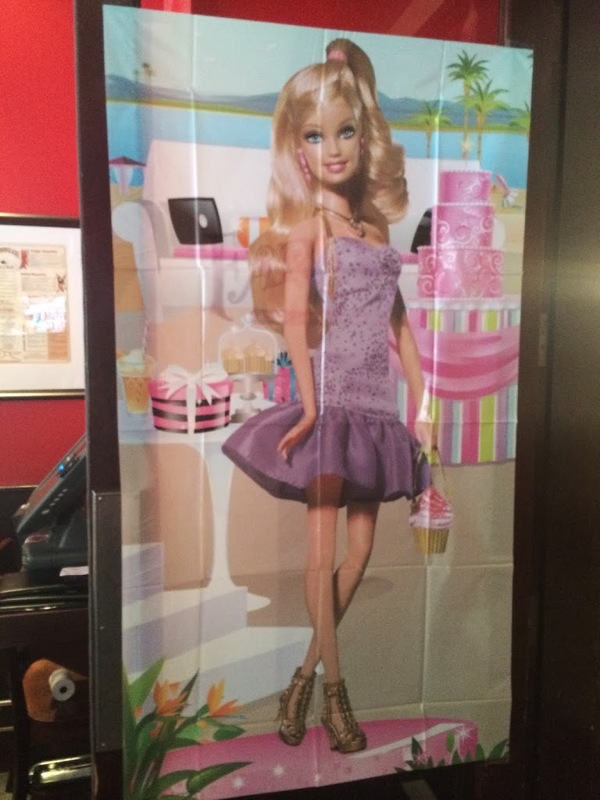 Barbie turned 55 yesterday! She’s looks absolutely amazing for her age, don’t you think? I grew up loving Barbies. I think Barbie was a favorite of most little girls and still is. 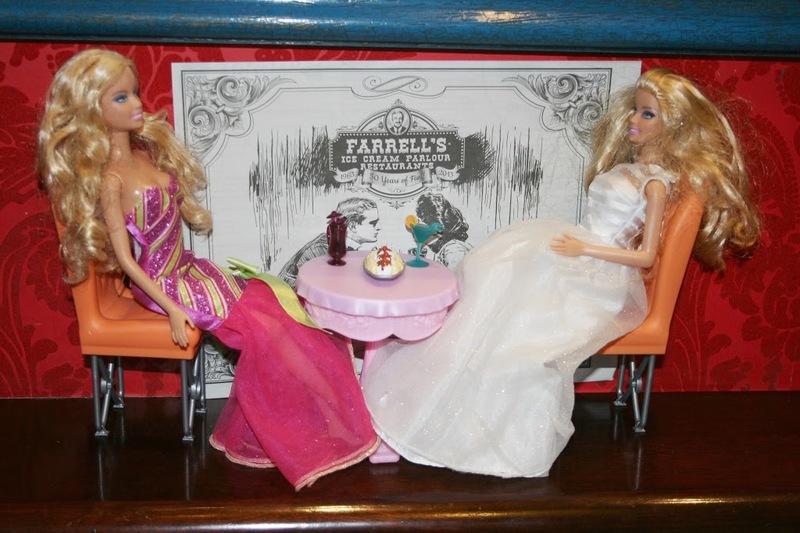 Emi and I had the chance to attend Barbie’s birthday celebration at Farrell’s Restaurant. 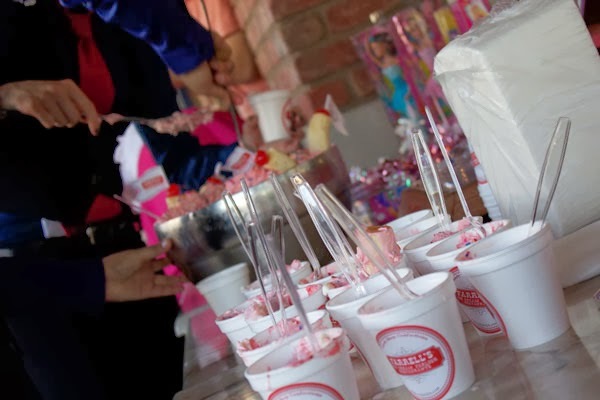 At each of their participating restaurant locations, there was a special celebration which included appearances by Barbie and Ken, games, prizes and even a special Barbie Birthday Zoo for the kids to share. We arrived a little bit early to find several little girls anxiously awaiting the start of the party and playing with their own Barbies outside of the Farrell’s door. 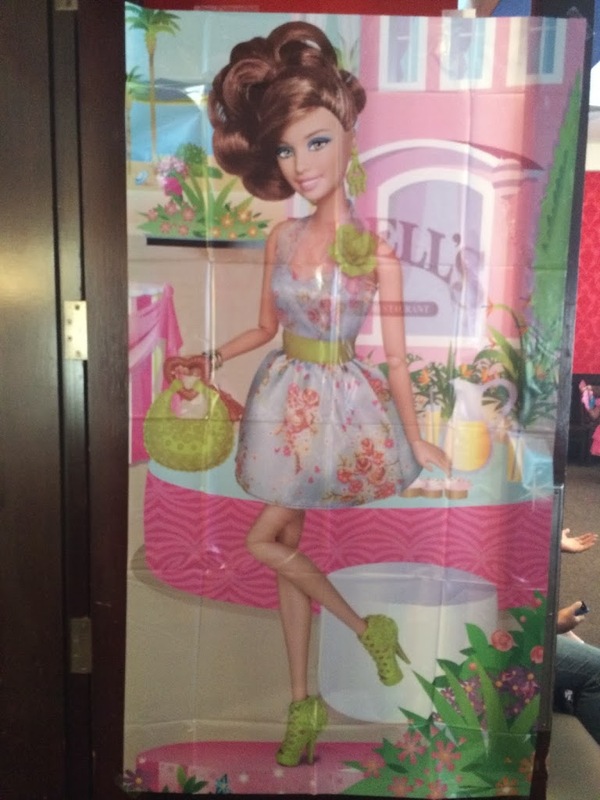 we saw that the room was decorated for Barbie’s birthday. 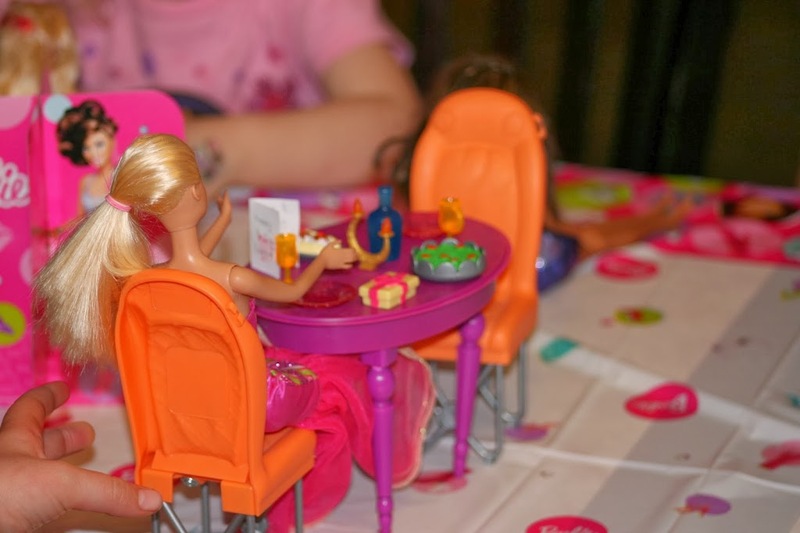 Emi insisted that we bring her own Barbie table and chairs and she set it up right on the party table. (notice Barbie’s own tiny banana split and homemade birthday card on her table). All of the children were so excited when the party host first introduced Ken! Everyone clapped and Ken appeared in the room. I couldn’t help but laugh out loud because he kept the stiff posed arms throughout the celebration. The Ken they chose was so adorable and had so much personality! with her stiff arms too. Barbie was as adorable and talented as Ken was. The kids were so excited to play games with Barbie and Ken. 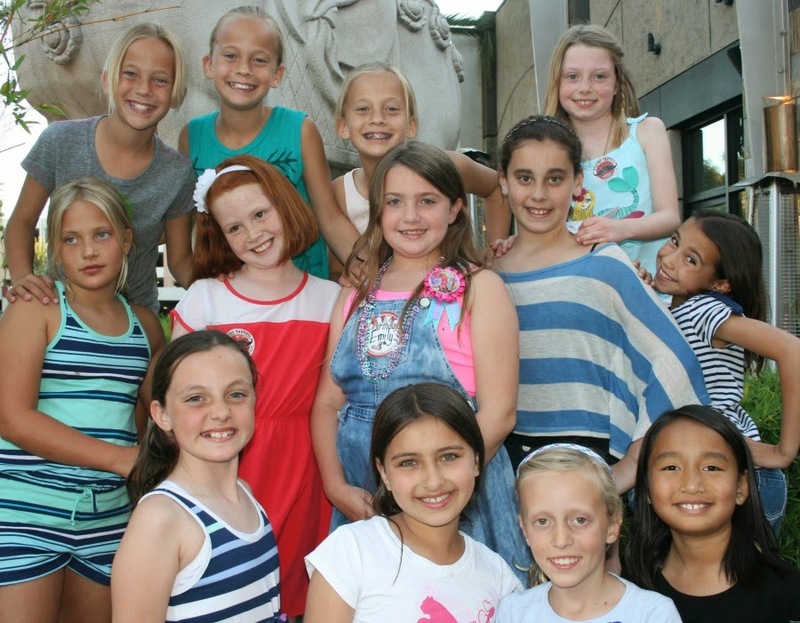 First they played a trivia game, to see how much they knew about Barbie! Emi actually won TWO prizes in the trivia game! I have no idea how she knew Barbie’s full name, but that was one of the questions she answered! Then they played “Hot Pig” (it’s like Hot Potato) with Barbie while Ken played the drum. Did I mention that this Ken is amazing on the Farrell’s drum? After the games, the kids all got to share the special Barbie Zoo! What a treat! Emi was in heaven getting to have ice cream at 10:30 a.m. and before lunch! 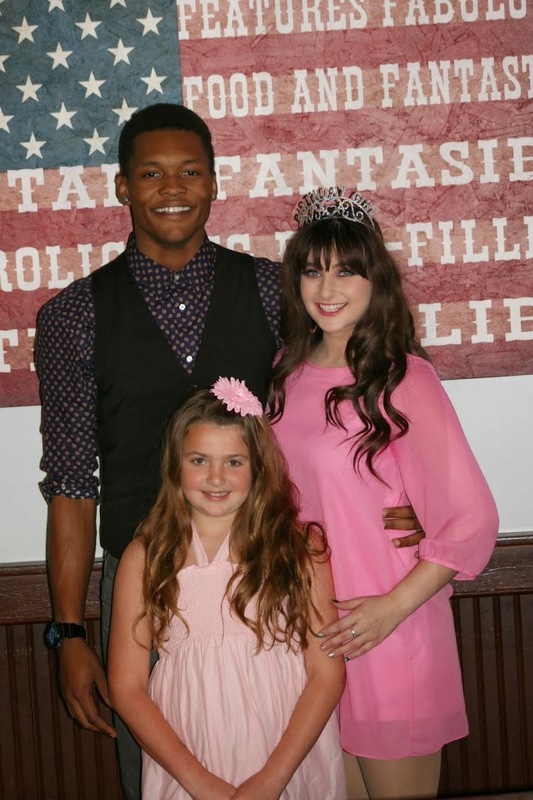 At the end of the party, the kids got to have their pictures taken with Barbie and Ken! The most powerful part of the whole event for me, was the statement Farrell’s made, without saying a word! For them to show the children (and adults) in attendance at Barbie’s birthday celebration, that Barbie and Ken are NOT ALWAYS blond-haired and blue-eyed with white skin, was something that I wish more companies would do. I don’t think there was one child at the party who noticed anything different about this Barbie and Ken, which is what makes me smile most! I thanked the manager, Chad, not only for hosting this fun event, but also for opting to feature a non-traditional Barbie and Ken to the kids! I honestly think there needs to be more of these kinds of occurrences in our society! Thank you Farrell’s! You really wowed me…again! 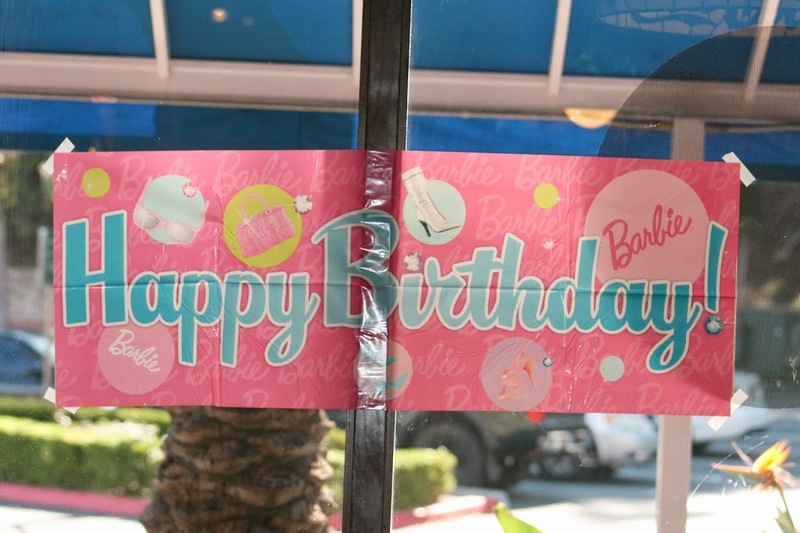 Celebrate Barbie’s Birthday at Farrell’s! Did you know that Barbie is going to turn 55 this year? 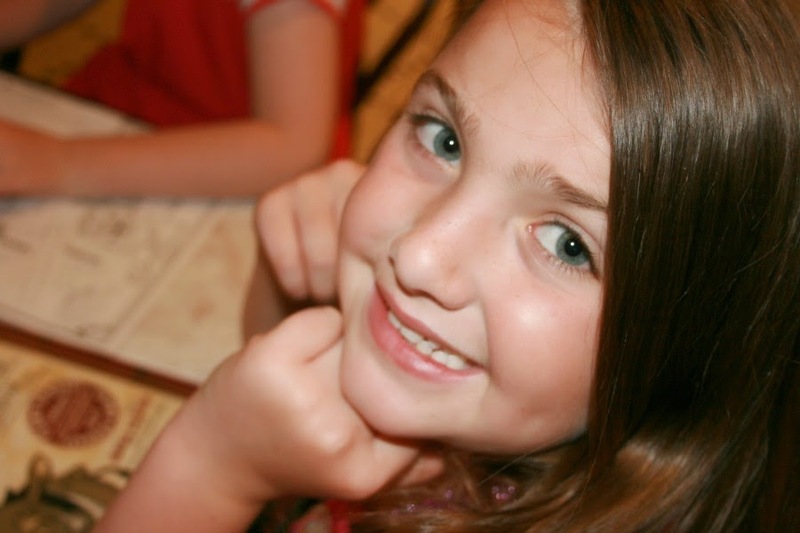 Yep, her birthday is on March 9th and what would be a better way to celebrate than a trip to Farrell’s? 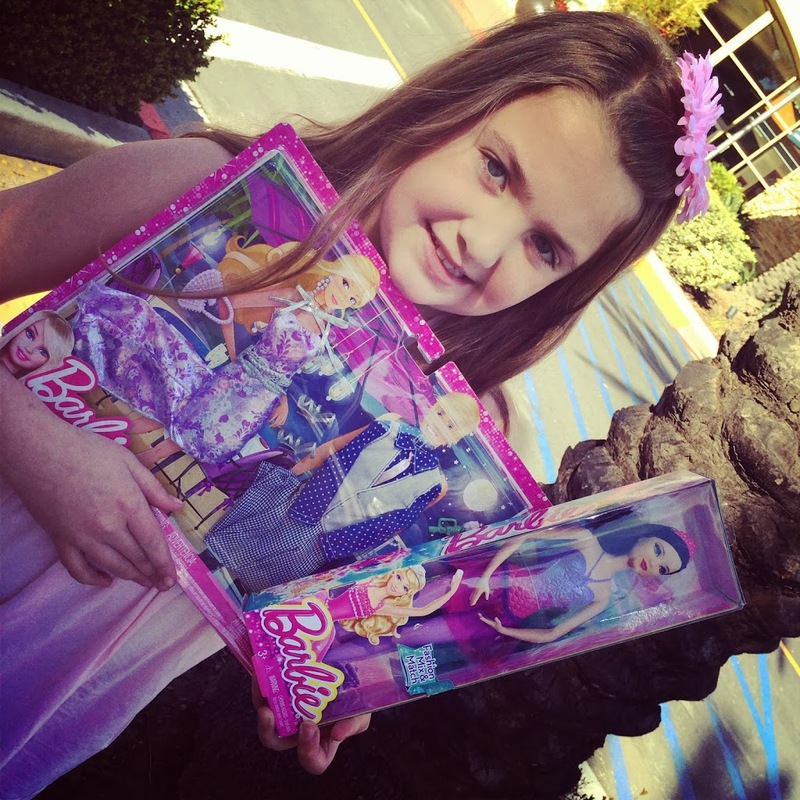 Last year Emi and I each chose a Barbie to take with us to our local Farrell’s restaurant on Barbie’s birthday. Emi also insisted we bring a table, 2 chairs and some Barbie-sized food for them. We set up their table for 2, right above our own. I fell completely in love with the special Barbie Sundae that we got! Seriously, the pink whipped cream was SO yummy! I cannot wait to go back again this weekend and participate in all of the festivities they’ll have going on! 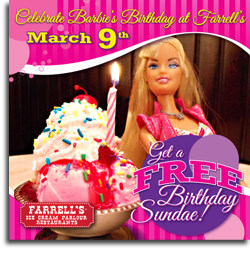 This Sunday, March 9th, you too can bring your Barbie into any one of the Farrell’s locations, to celebrate her 55th birthday with free birthday ice cream, presents, and surprises! 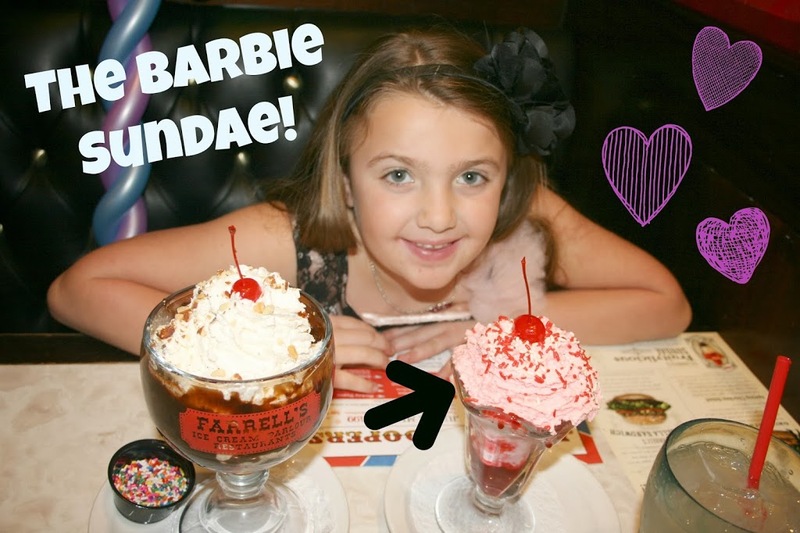 To celebrate America’s favorite doll’s 55th birthday, Farrell’s Ice Cream Parlour Restaurants is going to throw a birthday party for Barbie like only Farrell’s can! Kids and kids at heart will join Barbie and Ken look-alikes this Sunday, March 9, from 10 – 11am at all seven California Farrell’s locations. 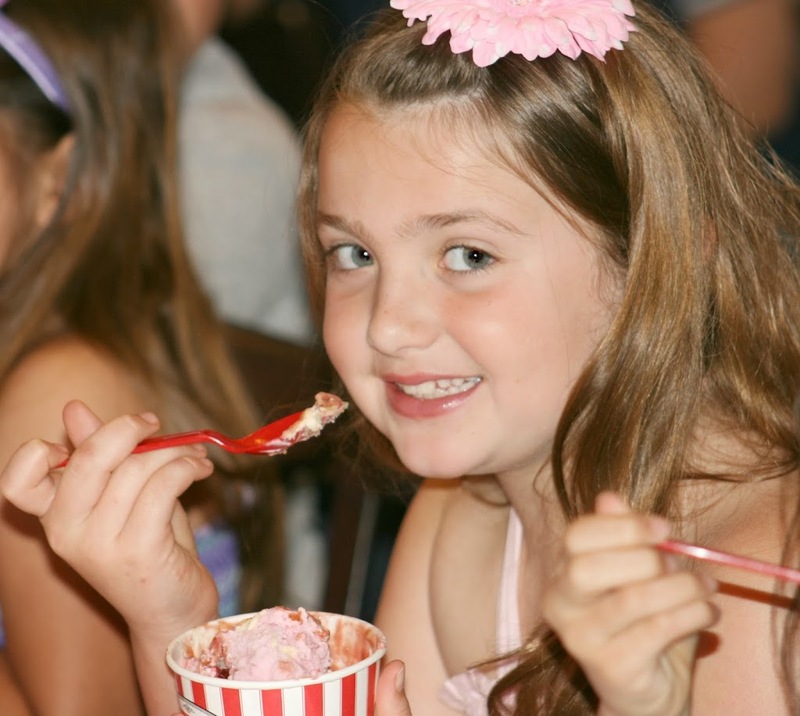 A special Barbie-inspired, 30-scoop – 7 1/2lb., Farrell’s famous ice cream Zoo will include, among other ingredients, a pink strawberry ice cream, rainbow sherbet, sprinkles, whipped cream, strawberry sauce and cherries with the guest of honor herself sitting atop to be run around the entire restaurant. 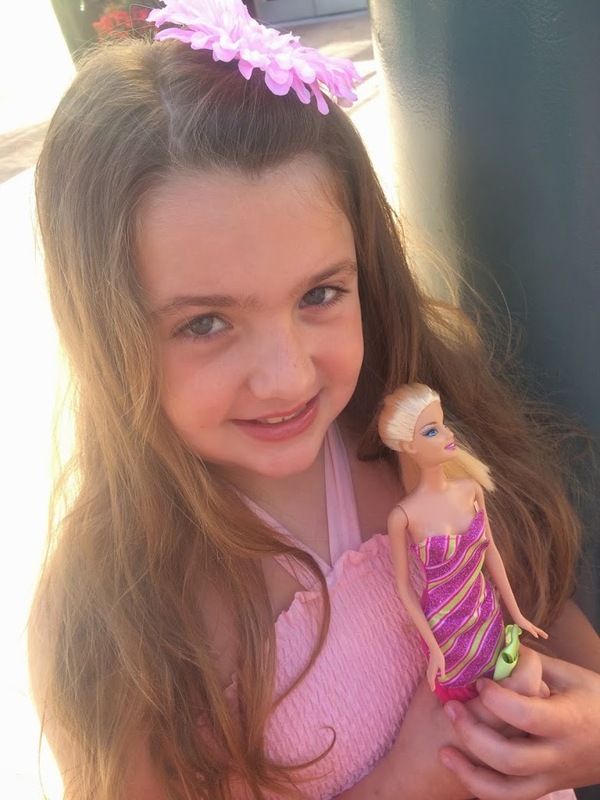 A special Barbie birthday song has been created and will be sung before the kids get to eat the Zoo for free and birthday presents are given out. 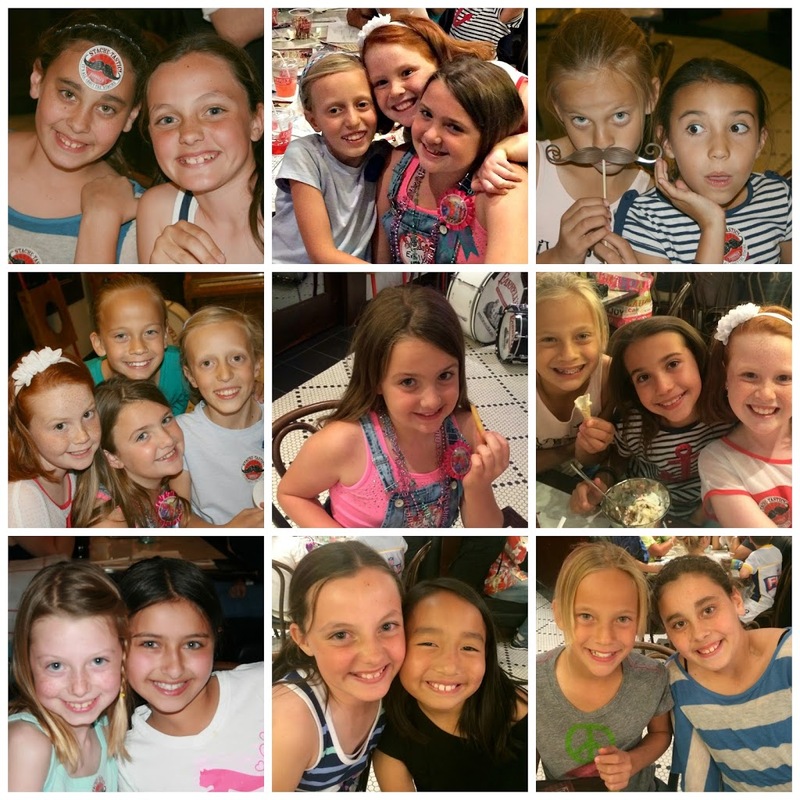 Check out some pictures from last year’s celebration! 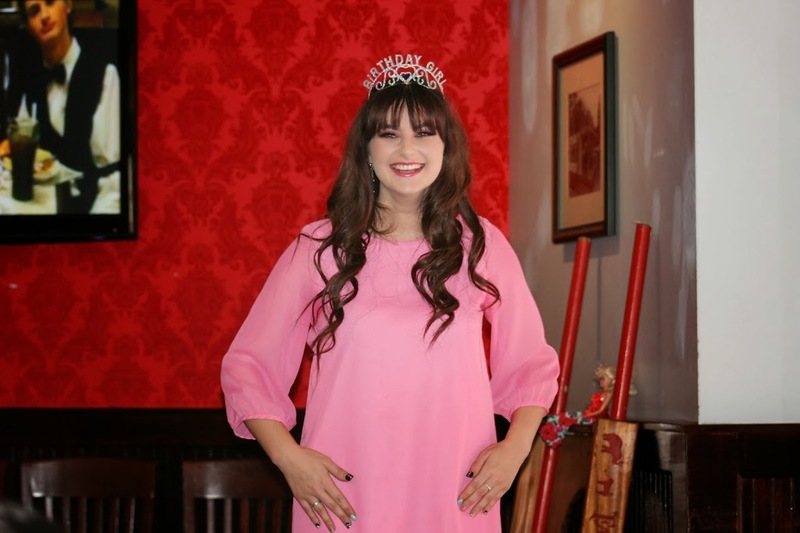 For guests that can’t make it to the 10am main birthday event, Farrell’s will be celebrating all day by selling a pink $1.99 birthday-sundae to all guests that bring in their favorite Barbie doll and purchase a kids or adult entrée and drink. The special $1.99 birthday sundae is fashioned from one-scoop of strawberry ice cream, strawberry sauce, pink whipped cream, party sprinkles and a cherry on top. For complete details, limitations and rules for this event please see FarrellsUSA.com. Barbie is a trademark of Mattel Inc. and is in no way associated with this event. 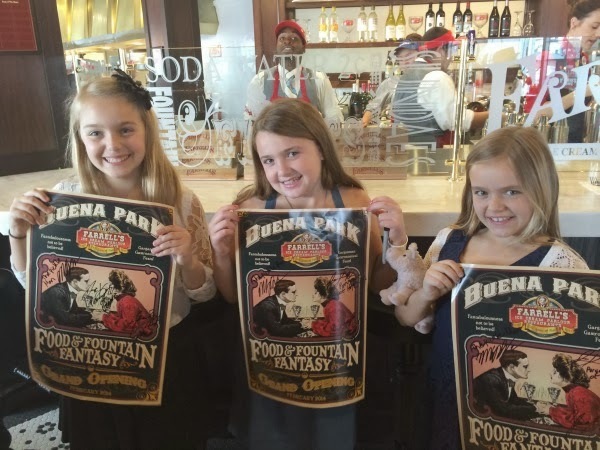 Fun at the Newest Farrell’s in Buena Park! February 26, 2014 / Food, Let's Eat! 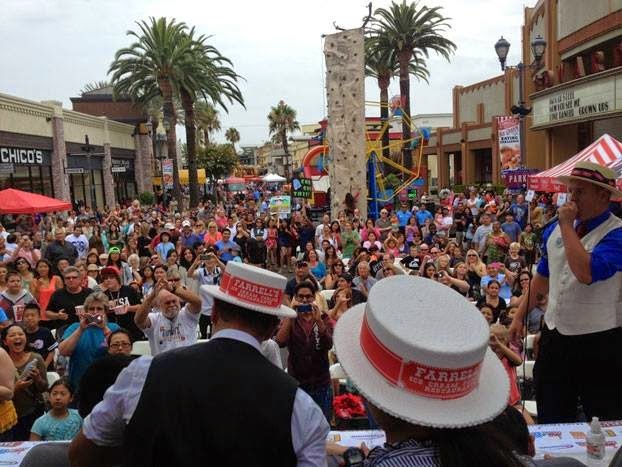 We were so excited to attend a pre-opening VIP event last weekend at the new Farrell’s in Buena Park. It actually didn’t feel like we even went to a restaurant, it was more like this giant party with 200 of our newest friends, that just kept on going! I love the location of this newest Farrell’s because it’s very close to so many of the family attractions that the city of Buena Park has to offer, including Knott’s Berry Farm and Medevial Times. 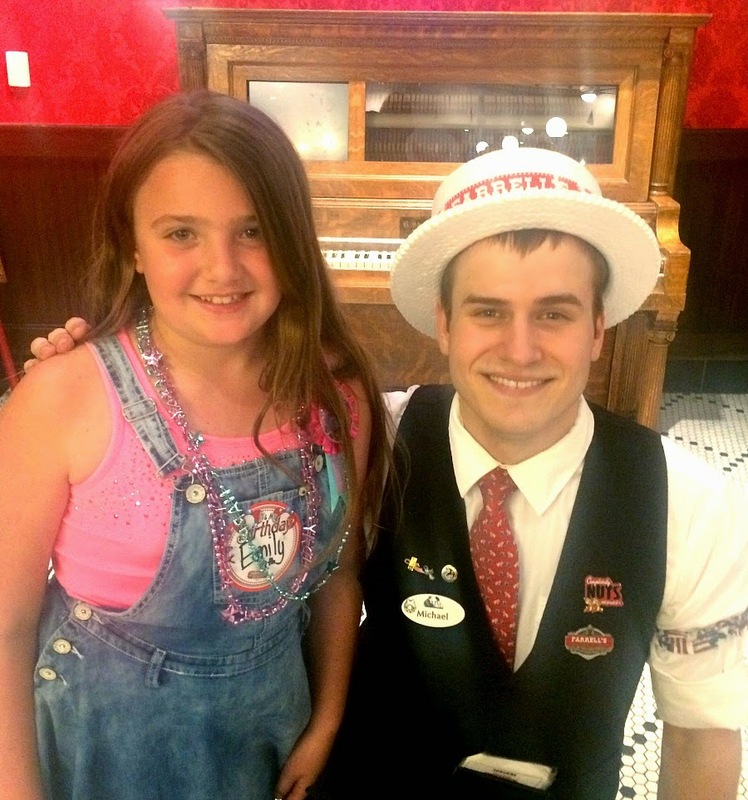 After checking in with the Farrell’s hostess, we were greeted by Alesha from Medevial Times. She had a promotional table set up and was handing out Medevial Times swag and coupons for the attraction. Alesha really interacted with my girls and even visited our table a few times, once we were seated. 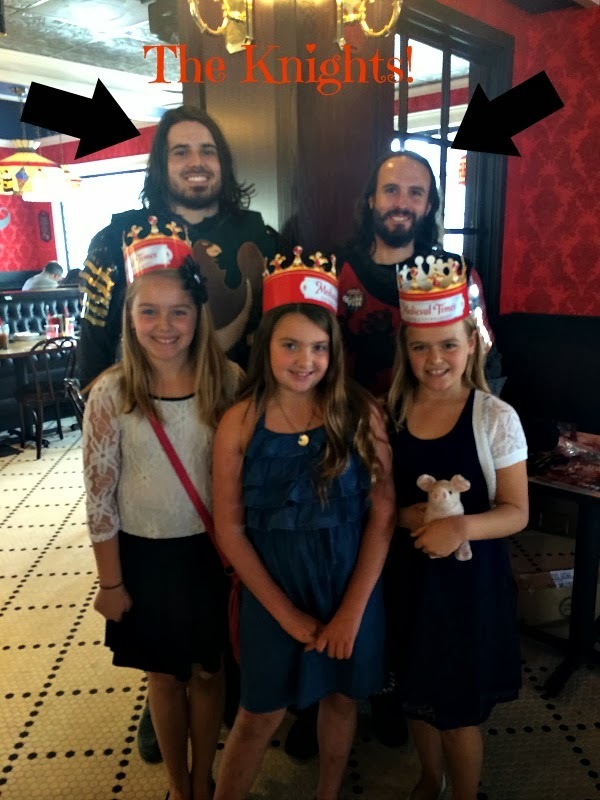 Two of the Medevial Times’ Knights were walking around inside the restaurant, passing out t-shirts and crowns and helping the Farrell’s crew deliver some of the exciting desserts that require a whole lot of singing and hoopla! 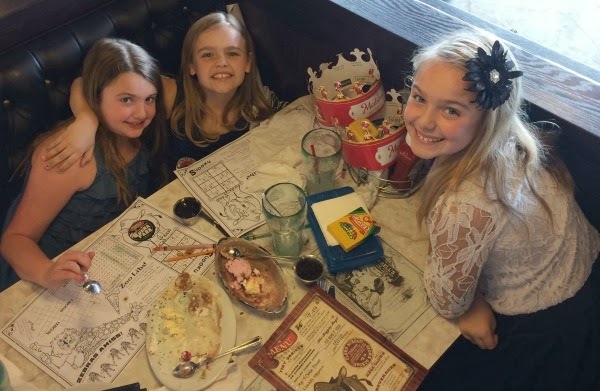 The girls REALLY wanted to order The Zoo, which is one of those desserts, JUST so they could have it delivered by the knights, but we also knew there was NO WAY that the four of us could finish a dessert that had like 1000 scoops of ice cream! The energy of the entire staff at Farrell’s was amazing and it was something you could feel right when you walked in the front door! I think this is why it felt like we were at a party. While you’re at your table, you are constantly being invited to participate in songs and clapping and although it does seem like there’s non-stop drum banging occurring throughout your entire visit (because there is), you’re so busy having fun that you don’t seem to mind it nor the fact that your child or children are NOT sitting quietly at your table and that’s OK under these circumstances! 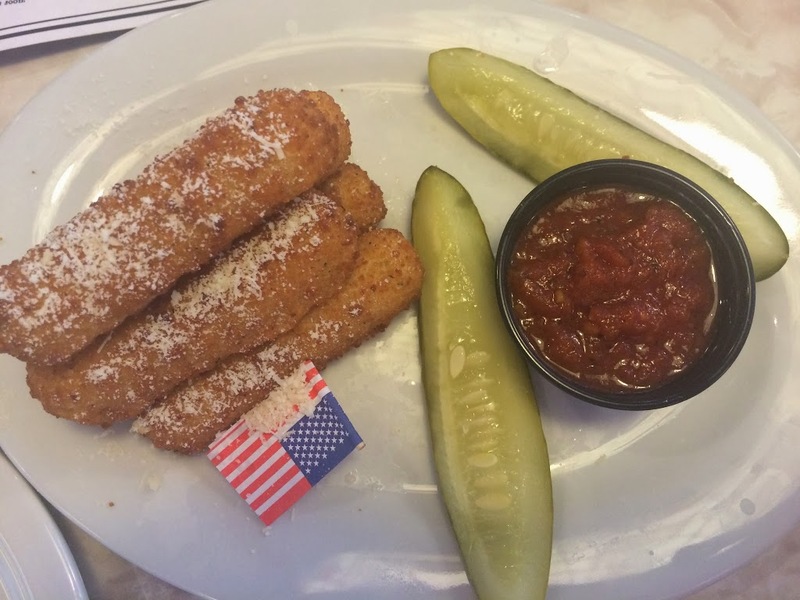 We started off with Farrell’s Ooey Gooey Cheese Sticks as an appetizer. 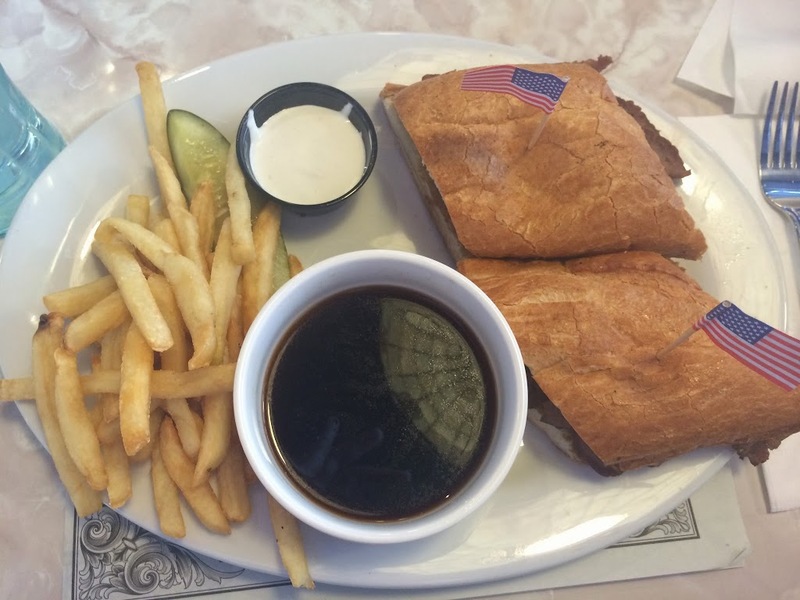 For lunch, I ordered the Fabulous French Dip sandwich and the girls all ordered the sliders off of the children’s menu. There was even an option to upgrade the regular fries to chili cheese fries, so of course they hopped on that opportunity right away! 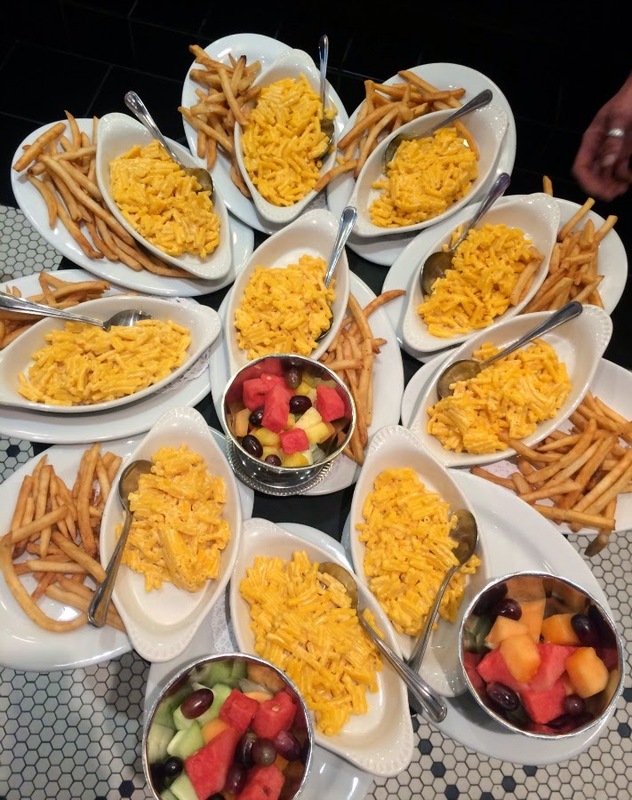 We were careful NOT to eat too much regular food since we were ultimately trying to save room for some of their infamously crazy-good desserts! 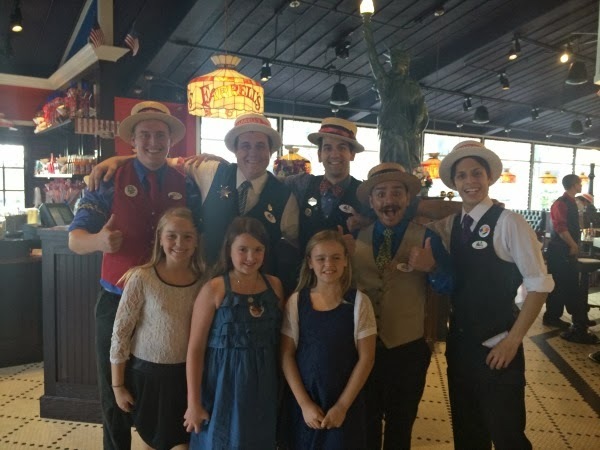 Farrell’s isn’t just a fun family restaurant, it’s a total entertainment package, something that you don’t get at typical restaurant. This was apparent after just a few of the talented and energetic crew spent some time at our table, amusing the girls. First, “Max” stopped by our table, and the girls immediately spotted one of the buttons he was wearing which had a pickle on it. He then explained to me that the button was actually Mr. Bob Farrell’s original motto. 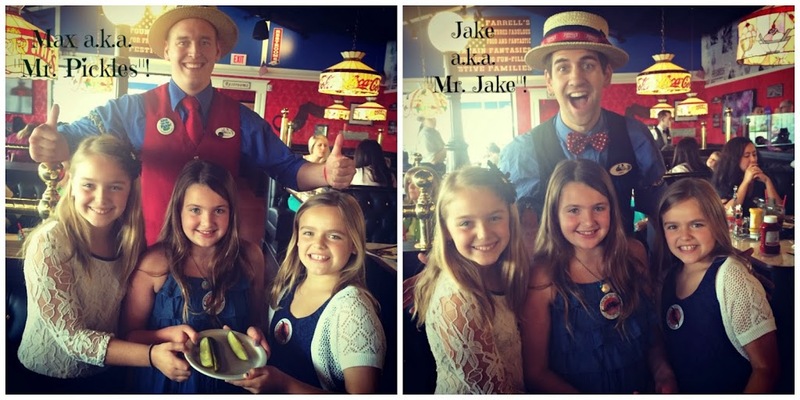 I think the girls took that as their cue to not only start asking him for pickles every time he passed by our table, but also to nickname him “Mr. Pickles“! Not long after that, we came to learn that “Mr. Pickles” was actually half of an infamous entertainment duo that you can probably meet at just about any Farrell’s community event, and at a future Farrell’s openings. 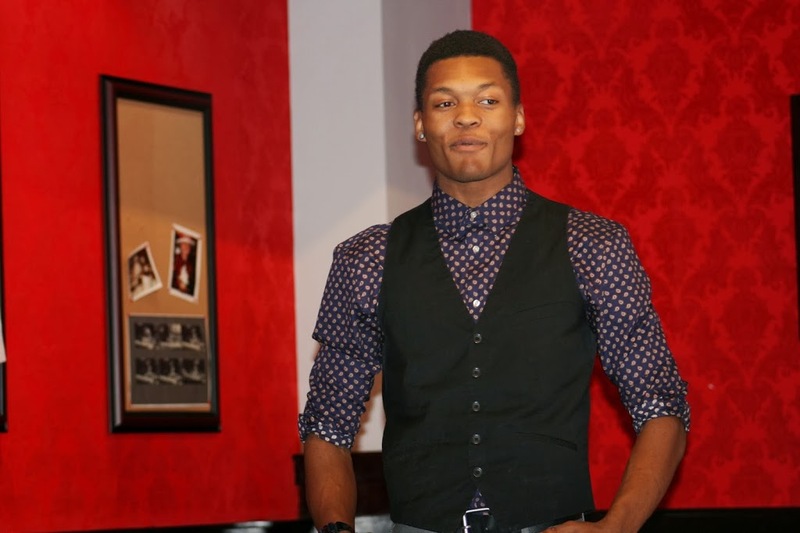 The other half of the duo was nicknamed “Mr. Jake” by the girls. Jake is best known as “The Purveyor of Good Times” in the Farrell’s world. These 2 guys were so good with my girls, brought them stickers, pickles and took boatloads of pics with them. I think the girls instantly became lifelong fans after spending about 5 minutes with this duo! 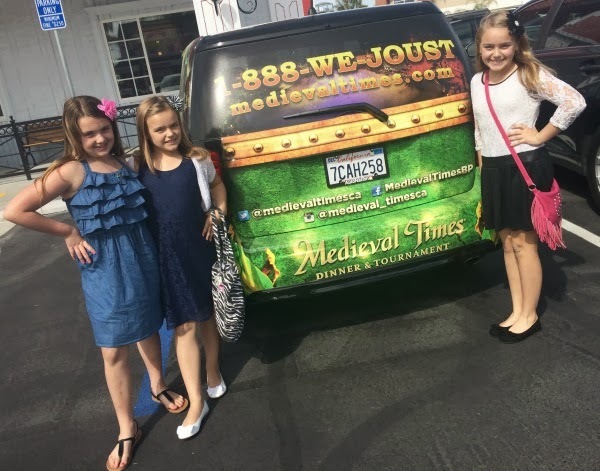 The girls were extremely impressed when they got to witness an epic ice cream eating contest between the Medevial Times knights and the team of “Mr. Pickles” and “Mr. Jake“. Each team took a very different approach to how they were going to beat out the other one. While the knights continued mowing through their trough, the Farrell’s duo actually utilized glasses of water to wash it down, while stirring the ice cream and making it more liquid. I couldn’t actually watch for very long, but the fact that “Mr. Jake” did it all with a camera headband on is even more hilarious! I’m kinda wondering where THAT video footage is? 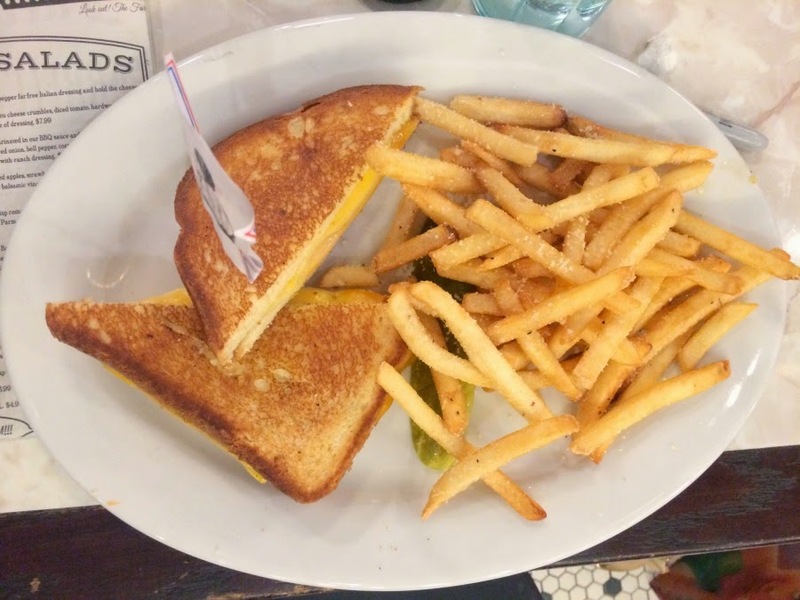 Everything about Farrell’s is so nostalgic. 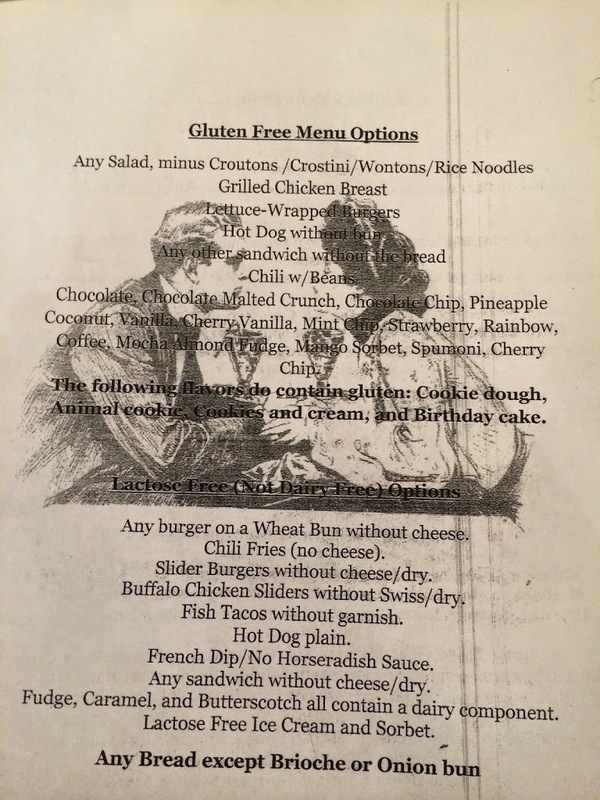 Their menus are printed on newsprint and you actually can take them home with you. The drinks are served in (plastic) vintage Coca-Cola glasses and there are little American flags stuck into just about every appetizer, burger and dessert. The decor is mostly black and white, with touches of red here and there and each table has an old-fashioned stained glass lamp hanging above it. The servers wear uniforms adorned with armbands and these adorable straw hats that are available for purchase in their shop. 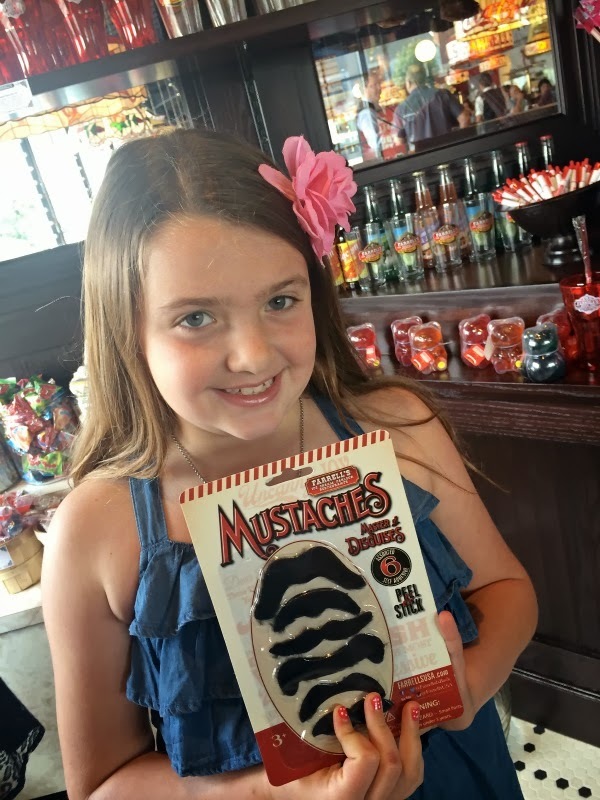 Each Farrell’s location features a shop where you can buy logo merchandise and choose from a HUGE variety of old-fashioned candies. 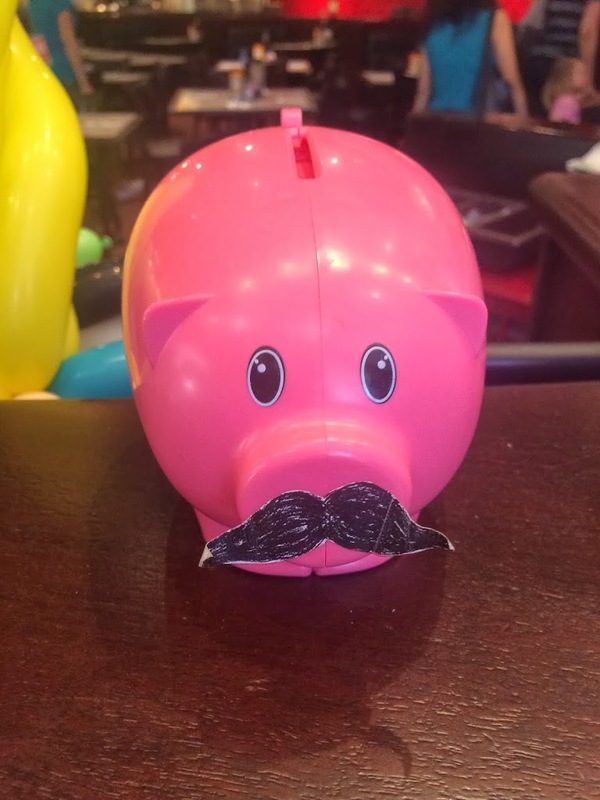 The shop also has a ton of other fun trinkets available, including Farrell’s mustaches. My daughter and her entourage just didn’t want to leave the place! I don’t think we were there any less than 3 hours! After they spent time getting their posters autographed by their staff favorites, and taking MORE pictures with them, it was finally time to say goodbye! 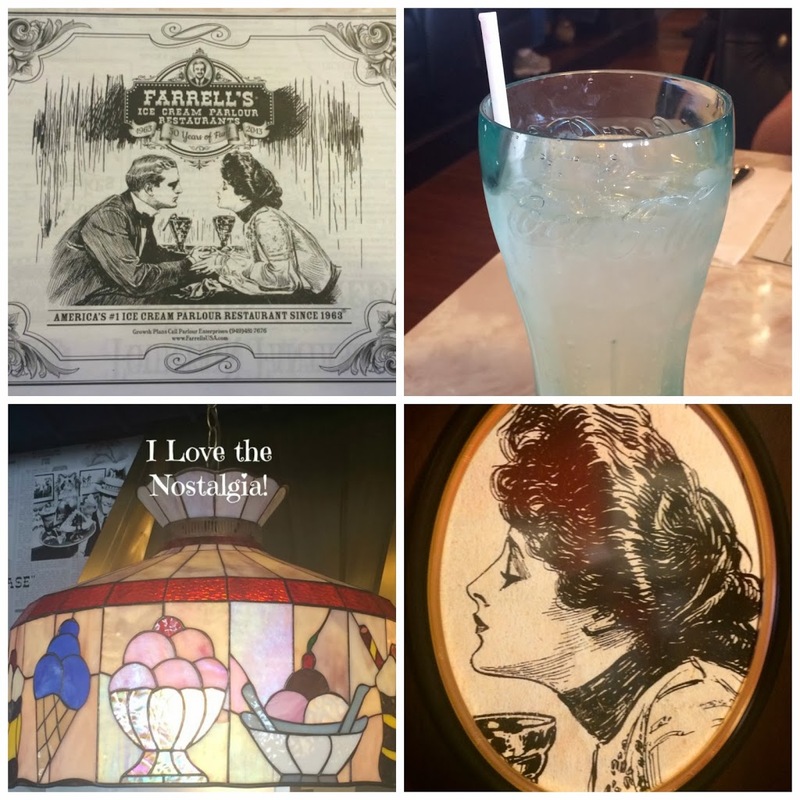 Whether you remember Farrell’s from its way-back-when original locations, or you are just learning about it now, it’s something you need to experience just once! Emi hasn’t stopped talking about it since the other day and is just begging to go back again. It was THAT much fun! 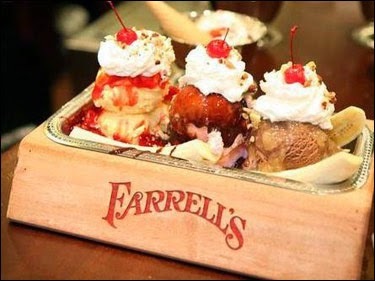 Farrell’s in Buena Park is NOW OPEN!